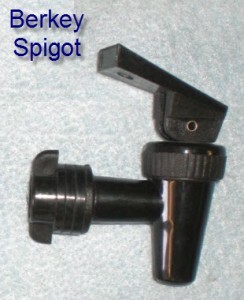 This simple water purifier spigot can be used on any of our water purifiers (even home made “Bucket Purifiers”). A Simple Water Spigot that can Attach to any of our Systems, or one you Make at Home. NOTE: Buy this item locally if your order doesn't total at least $50.00 We really don't want to charge you all the extra shipping! 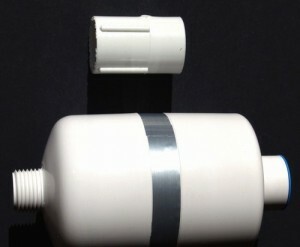 This stainless steel water purifier spigot can be used on any of our water purifiers (even home made “Bucket Purifiers”). 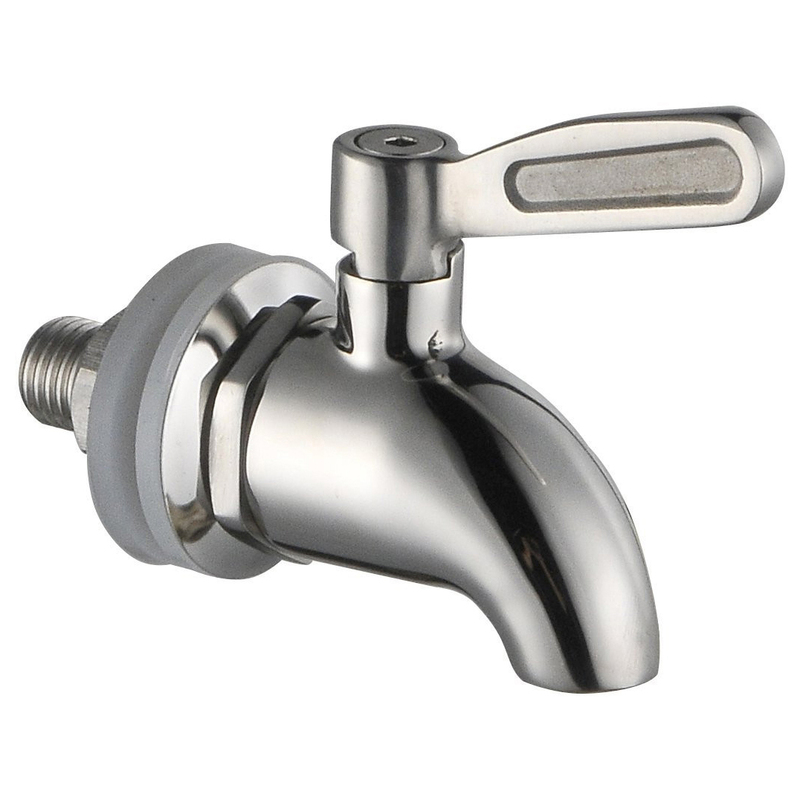 A Stainless Steel Water Spigot that can Attach to any of Our Systems, or One You Make at Home. 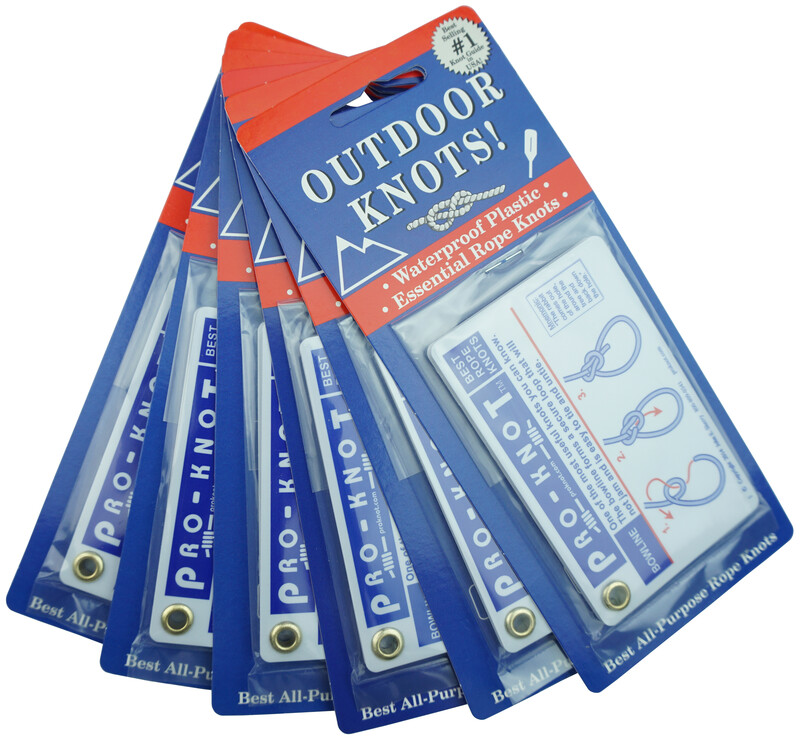 Includes (2) Food-Grade Silicone Washers, Stainless Steel Washers, and a Wingnut. NOTE: Buy this item locally if your order doesn't total at least $50.00 We really don't want to charge you all the extra shipping! Use this simple Berkey Primer to prime your Black Berkey Purification Elements at Home OR anywhere line pressure is unavailable! You can use it to 1. PUSH clean water through your elements to prime them from the inside out… OR, 2. PULL raw water through your elements from the outside in (purifying it as it is drawn through the element.) Both ways give you a great prime! You can also use it to speed the purging/drying process if you want to put previously used elements into long-term storage. Most people find this primer easier to use than the “Priming Button” supplied with Black Berkey Purification Elements! Use the new Berkey Primer to prime your Black Berkey Purification Elements at home or off the grid! This Is Our Premium Water Purifier Spigot. It has been specially designed for our stainless steel water purifiers so you can easily see how much pure water remains in the lower chamber without removing the upper chamber to peek inside. 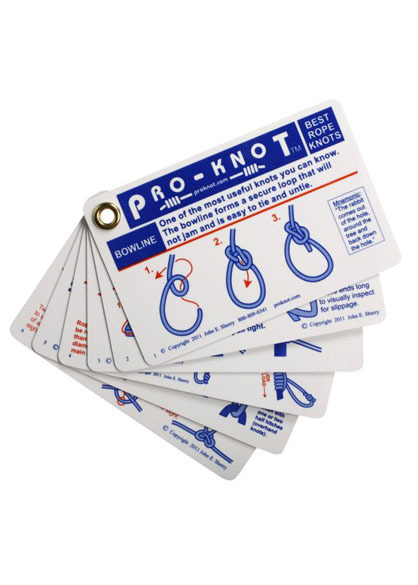 It is very handy! 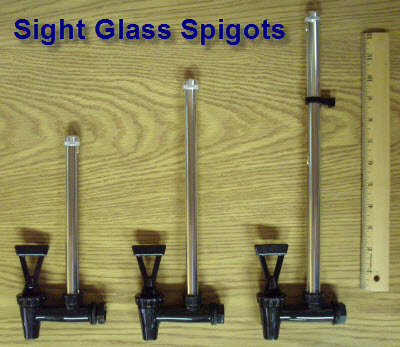 See-Through Water Spigot Specially Designed for Our Stainless Steel Systems. 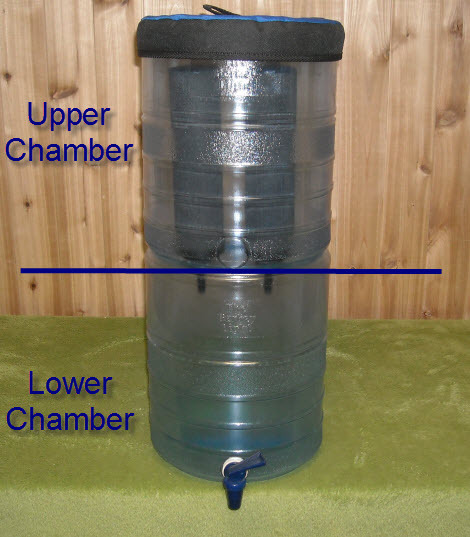 It Lets You See How Much Pure Water is in the Lower Chamber. The Berkey® Systems Stand adds design and function to your stainless steel Berkey® system. Each polished stainless steel wire stand is 5” tall and allows you to easily fit a glass or cup under the spigot. 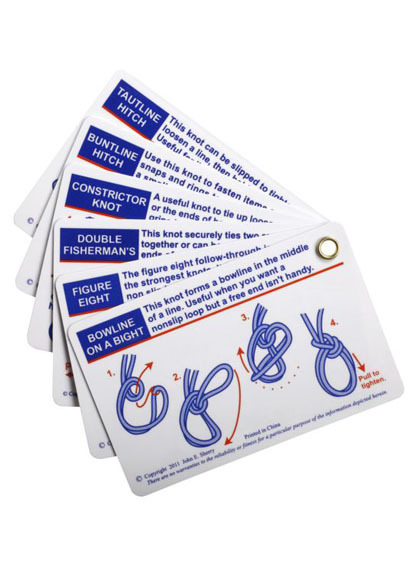 The feet are made of a non-marking, non-marring rubber that is bonded to the stand for added durability and stability. The stands are available in 4 sizes, designed to fit each Berkey® stainless steel system. $35 for the Small, $37 for the Medium, & $39 for the Large Base. 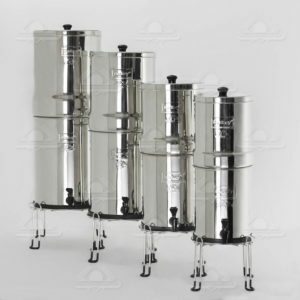 These Berkey Bases come if four different sizes to fit each Berkey System. The small base fits the Travel Berkey system, the medium base fits the Big Berkey system, the large base fits the Royal Berkey system, and the extra large base fits the Imperial & Crown systems. 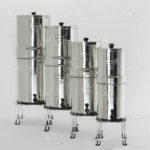 This is a Replacement Base for ALL Berkey Light Models, or an Add-on for the “Big Berkey” stainless steel water purifiers. Just choose “Lighted” (Blue or White) or “Not Lighted.” The image shown is of a “Lighted Base.” A “Not Lighted Base” looks just like the image only it does not have lights in it. The Berkey Light Base will fit any Berkey Light Water Purifier and can be used with the "Big Berkey" stainless steel purifier. Chose your base with or without lights. The $29.00 Base Has No Lights In It. 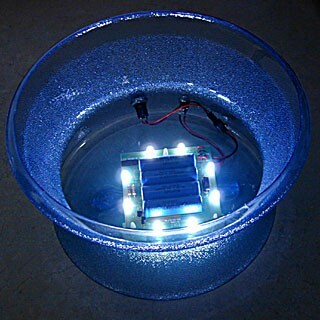 It costs $59.00 more to add white or blue lights to the base. These are Replacement Chambers for ALL Berkey Light Models.” Please Select “Upper Chamber” or “Lower Chamber” in the Drop-down Box Below. Chambers DO NOT Include: Spigot, Bonnet, Base, or Purification Elements. 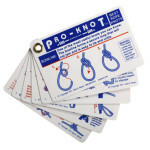 You May Add These to Your Order Below or Add Items From Any Other Listings On This Website. Replacement Chambers for The Berkey Light Water Purifier. Choose "Upper Chamber" or "Lower Chamber" in the Drop-down Box Below. PLEASE NOTE: Whichever Chamber You Order Will Come Empty. You Are Buying an Upper or Lower Chamber ONLY. These are Ceramic Water “FILTER” Elements. Our “Black Berkey” elements are Water “PURIFICATION” Elements. There is a significant difference between the two types. Both Elements “Filter” but only the Black Berkey Elements “PURIFY” water. Super Sterasyl Ceramic Water FILTERS. These elements "Filter" water but are not sold as water "Purifiers." Sold always as a single filter additional filters in the drop-down box below. The Sterasyl™ ceramic is the ceramic shell used for the Super Sterasyl™ filter element. Accordingly, this filter element will have, at a minimum, the filtration benefits of the Sterasyl™ ceramic. Additionally, the bore of the ceramic shell is filled with granular activated carbon, which enables the filter to reduce chlorine and organic chemicals while improving the color, taste, and odor of the source water. The re-cleanable Super Sterasyl™ filter elements remove suspended solids, parasites, cysts and pathogenic bacteria (>99.99%) and reduce organic chemicals, pesticides, herbicides, organic solvents, trihalomethanes, SOCs, VOCs and foul tastes and odors. The top of the Super Sterasyl™ element is closed with a unique ceramic dome. This prevents the possibility of breaching (leakage), which can occur with filtration elements that are closed with a plastic cap. Cryptosporidium Parvum and Giardia Lamblia – 100% removal (based on tests by Arizona State University). ISO-9000: 2000, Hyder Labs – UK, Spectrum Labs – UK, WRc – Mednenham UK, Clare Microbiology – UK, Loughborough University – UK, University of Arizona – USA, Thresh, Beale, and Suckling – UK, and WRc Gwent – UK. Mitosis is the name for the usual method of bacterial cell division. This division is characterized by resolving the chromatin of the cell nucleus into a threadlike form that condenses into chromosomes, each of which separates longitudinally into two parts, one part of each chromosome being retained in each of the two new daughter cells. When conditions of growth (cell division) are right (proper environmental conditions, temperature, pressure, etc.) and sufficient nutrients, the “threadlike forms” can penetrate ordinary ceramic structure and create bacterial cells on the inside of ceramic elements. The Sterasyl™ grade filter elements incorporate pure silver into the porous ceramic shell, which inhibits mitosis or “grow-through”. The dual media KDF Shower Filter will typically last 25,000 gallons or one year whichever comes first. 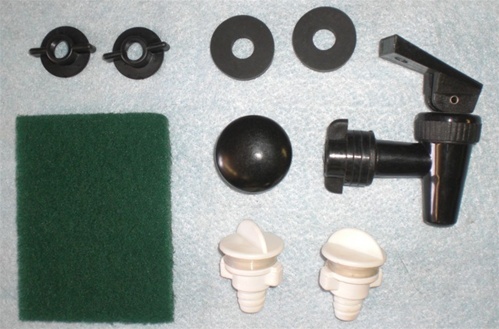 The shower filter contains KDF 55 granules, which are most effective in removing or reducing chlorine, hydrogen sulfide, microorganisms, scale and water-soluble heavy metals such as lead, mercury, and iron. KDF process media also kill bacteria and inhibit the growth of bacteria, algae, and fungi. As an added benefit, KDF media reduce lime scale, mold, and fungi in your shower. KDF process media are completely safe so the process is not toxic and does not cause any adverse side effects. • In the shower environment, chlorine can either be in liquid or gas state. At higher water temperatures in the enclosed shower stall, free-chlorine moves from the liquid to the gas state, where it vaporizes and subsequently is inhaled. The United States regulates all shower head flow at 2.5 gallons per minute. Thus, the science behind shower filtration must take into account the unique situation in the shower, including temperature, flow rate and volume. • Our dual media KDF Shower Filter works on a similar principle to a Catalytic Converter in an automobile. In shower filtration free-chlorine is converted into a harmless chloride. The scientific name for this chemical reaction is known as “Reduction-Oxidation”, commonly referred to as Redox. Redox reactions can be chemically complex. Simply stated, during a Redox reaction electrons are transferred between molecules, creating new elements. For instance, when free-chlorine comes in contact with the filtration media, it is changed into a benign, water-soluble chloride. This reaction changes free-chlorine to a larger chloride element, too large to evaporate or be absorbed by the skin. It is then carried harmlessly through the water supply. Hospitals, restaurants, municipal water treatment facilities, and homes rely on KDF process media to safely reduce or remove free chlorine, iron, iron oxides, heavy metals, hydrogen sulfide and bacteria from their water. • KDF process media are high-purity copper-zinc formulations used in treatment applications to reduce heavy metals, hydrogen sulfide, microorganisms, and scale. Water filtered through redox media controls microorganism growth. Treating water reduces bacteria and other microorganisms by electron transport, causing cellular damage. KDF process media also kill bacteria by direct electrochemical contact and by the flash formation hydroxyl radicals and hydrogen peroxide, both of which interfere with a microorganism’s ability to function. High-purity copper-zinc redox media consistently remove 99% of free chlorine by electrochemically reducing dissolved chlorine gas to water-soluble chloride ions. • Redox media remove up to 98% of water-soluble cations (positively-charged ions) of lead, mercury, copper, nickel, chromium, and other dissolved metals. When filtered through KDF media, soluble lead cations are reduced to insoluble lead atoms, which are electroplated onto the surface of the media. All forms of KDF media are guaranteed for product purity, and a certified analytical sheet accompanies each manufacturing run. Patented KDF process media are 100 percent recyclable and contain no chemical additives. KDF media also meet EPA and Food and Drug Administration standards for maximum limits of zinc and copper in potable water. 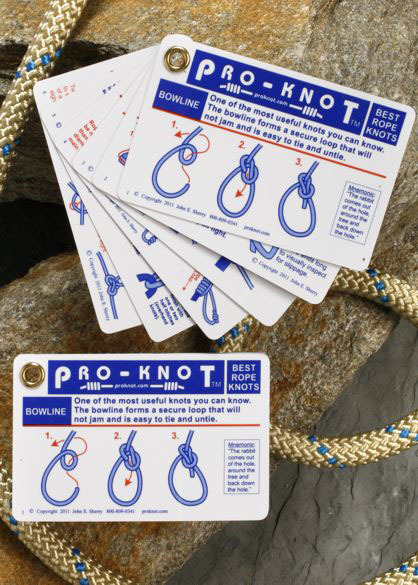 The 20 Best knots to cover every rope tying situation! 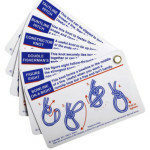 The easy to read step-by-step drawings are printed on waterproof plastic cards and are perfect for camping, boating, or keeping in your car. 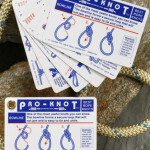 Small enough to carry in your pocket or stash a set in your backpack, boat or glove box!